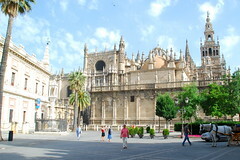 Seville is Spain’s fourth largest city. Seville webcam or Seville web cam as many people spell it, is simply a digital camera directly connected and linked to a computer which in turn is connected to the Internet. Some people also refer to these web camera as web cam Seville cams. These Seville webcams and Seville web cameras set up in the major Spanish city of Seville, Spain, are constantly on and transmitting and streaming live video, pictures and images of the Seville that you can see from your computer wherever you are in the world. A huge tourist destination in Spain due to it’s historic sights. 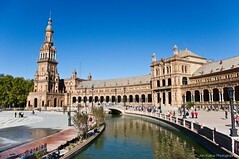 Seville is also known as Sevilla and is one of the best cities in Spain to visit. Seville is famous for bullfighting flamenco and the many fiestas throughout the whole year. Some Seville webcams transmit live up-to-date streaming images of Seville and other Seville webcam show views and images of Seville from earlier on in the day. The Isla Magica theme park is one of Spain’s most popular tourist attractions. It is divided into seven themed areas centred on a lake, each representing a different episode in Spanish history. The seven areas are Port of the Indies, Amazonia, Pirates Cove, Gate to the Americas, Fountain of Youth, Eldorado and the Fury of the Gods. Below we have a list of our individual Seville webcam pages. The Seville webcams below cover the major tourist sites of Seville. Seville webcams – Follow the link to see 45 web cameras covering the city of Seville. These webcams are traffic webcams but many are at the most famous tourist locations in the city. The webcams show these locations in Seville: Pasarela, Plaza de Armas, Luis Montoto – Luis de Morales – Kansas City, Macarena, Torneo – Barqueta, Ronda de Capuchinos – Ctra. Carmona, Luis Montoto – Amador de los Rios, Glorieta Marineros Voluntarios – Avda. de Mª Luisa, Puente Isabel II – Paseo de Colón – Arjona, Ronda del Tamarguillo – Ctra. de Carmona, Kansas City – Ctra. de Carmona, Kansas City – Efeso, Ronda del Tamarguillo – Avda. de Andalucía, Luis Montoto – Cruz del Campo, Ronda del Tamarguillo – Plaza Ruperto Chapí, Ronda del Tamarguillo – Avda. de la Paz, Paseo de Colón – Avda. de Roma – Paseo Delicias, San Francisco Javier – Ramon y Cajal, Avda. de la Raza – Bonanza – Pte. de las Delicias, República Argentina – Rubén Darío – Avda. 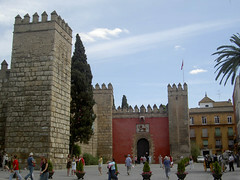 Blas Infante, Puerta de Carmona, Avda. de la Buhaira – Eduardo Dato, Glorieta de Santa Justa, Gran Plaza, Avda. de la Palmera – Glorieta Plus Ultra – Ctra. Cádiz, Avda. de la Palmera – Bueno Monreal, Puente del Patrocinio – SE30 – Avda. de Carlos III, Plaza de Cuba, Alcalde Luis Uruñuela – Palacio de Congresos, Ronda Pio XII – Avda. de Miraflores – Avda. Llanes, Glorieta de Juan Pablo II, Avenida de la Paz – Carretera Su Eminencia, Gta. República Dominicana – López de Gomara, Gta. República Dominicana – República Argentina, Gta. República Dominicana – Santa Fe, Gta. República Dominicana – Blas Infante, María Auxiliadora – José Laguillo, Bueno Monreal – Juan de la Cosa, Muro de Defensa – Avenida de Coria, Glorieta Olímpica, Ada, Montes Sierra. Meteo Sevilla – These weather webcams from Meteo Sevilla look over Seville city with views to the east and also south-east. The cameras are updated every 2 minutes. You can pick out the famous sights of the Alamillo bridge, the Olympic Stadium, La Giralda & Seville Cathedral. Please help us by suggesting any other Seville webcams that you know of in order to build our list of webcams in Seville. Seville webcams are great for people who have never been to Seville and who want to see what the city looks like. The famous Seville Cathedral, one of the biggest in the world. 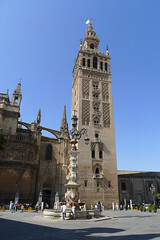 La Giralda, which is the tower which adjoins the Cathedral. The Real Alcazar which is a fine Moorish fortress. The Plaza de Espana is an amazing square containing fountains and is decorated by tiles showing all the provinces of Spain. As well as our webcams showing photos, pictures and images of Seville we also have a tourist information video below showing the most famous sights, attractions and notable landmarks in Seville. On the assumption that you were looking at Seville WebCams because you are considering visiting Seville, we thought it would be helpful to list the official Seville tourist offices which you may want to contact for further tourist information. Seville Webcams – Page Summary – This page contains links to webcams on the major Spanish city of Seville as well as videos of Seville. We show you Seville webcams so people who have never been can see what Seville looks like.